A JWindow is a container that can be displayed anywhere on the user’s desktop. It does not have title bar window management button menu bar or other trimming associated with a JFrame . It use BorderLayout by default . 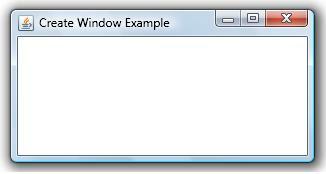 A Window object is a top-level window with no borders and no menubar. It could be used to implement a pop-up menu. The default layout for a window is BorderLayout .